Game centred learning and Gamification. What even is that? So I have noticed some confusion between teachers in the staff room about current buzz terms “Gamification” and “Game centred learning”. So I thought some clarification may be in order. In 2013 I was lucky enough to be part of a study into the use of game centred learning and gamification in my classroom. The first thing I though was “What the hell is gamification?”. Well, put simply, it is anything that turns learning into a game to engage students in learning, particularly in a competitive way. It could be a simple as a reward system using stickers when students reach a particular milestone in the activity. Conversely, game centred learning is when a game, particularly a video or computer game, is used as a stimulus for an learning activity. When I undertook a game centered learning unit in my classroom I used a game called “Machinarium“. The idea was for students to play the game, become involved in the rich imagery and use it as a stimulus for descriptive writing. My first hurdle was introducing it to parents. It turned out to be not as hard or controversial as I thought. I was advised by my mentor to send out a note discussing the benefits and purpose with curriculum links. I encouraged parents to see me if they had any concerns. On the whole I got more curiosity from them than anything. A few even asked for download links so they could check it out themselves at home. Probably one of the best lead-in exercises I did with my class was a “see think wonder”. 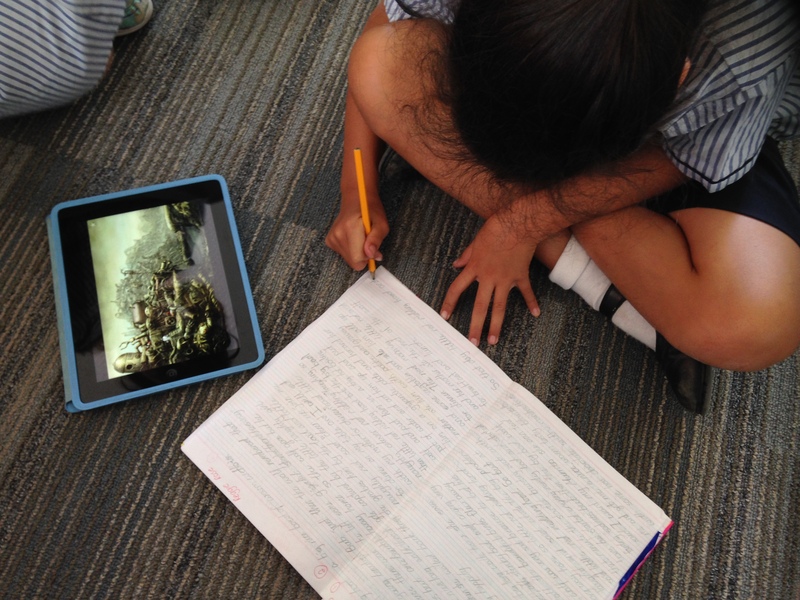 The students wrote what they saw, what that made them think and also what that made them wonder about from only the opening sequence of the game. The descriptive language they used was rich and vast. We used this to write descriptive paragraphs and the outcome far exceeded my expectations. The kids were completely engaged because it “didn’t feel like work”. By the end of the unit, I had a class set of 3-4 page narratives with the most descriptive language I have ever seen from 9/10 year olds. And this is only the very tip of the iceberg with what you could possibly achieve with game-centred learning. If you have any other ideas, please feel free to drop them into the comment box below! Posted on September 29, 2015 by rpayneportfolio • Bookmark the permalink. So good to hear from a grrrl gamer, and even better to picture you correcting the other staff about what gamification really is. I truly believe it will become a mainstream teaching technique very soon and then they’ll all need to know the difference! I was hoping to hear how the kids’ writing work was inspired by Machinarium – or is the exercise still occurring? © Content copyright - I Can't Even.